The redesigned EF 24-70mm f/2.8L II USM is the latest update to the acclaimed L-Series of EF optics, re-establishing a new standard for superb optics, high-end durable construction and performance in professional zoom lenses. A standard focal length zoom lens, it features a large aperture throughout its focal length. Featuring the latest advances in optical lens design, it utilizes 1 Super UD lens element and 2 UD lens elements that help minimize chromatic aberration in the periphery at wide-angle as well as reduced color blurring around the edges of the subject. 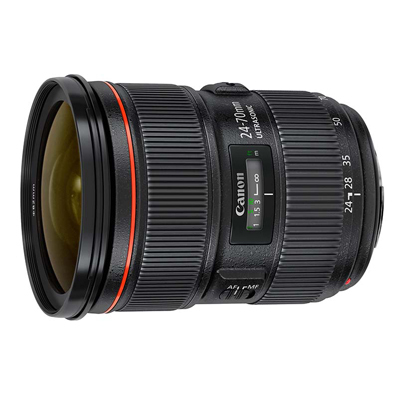 Canon EF 24-70mm f2.8L standard zoom lens is available for hire from RENTaCAM Sydney. every day photography, photo-journalism, weddings, traveling.